Three children are born in France. One, Rene, is the son of struggling farmers. One, Janine, a daughter of proletarians. The third son, Jean, is born in a manor house to wealthy bourgeois. These children grow up, are educated, find occupations often against the will of their parents, and enter relationships. They don't much think of themselves as laboratory rats, but they might be surprised how consistently their behavior is consistent with the involuntary responses of a rat. This observation is not intend as an insult to them, or to the rat. 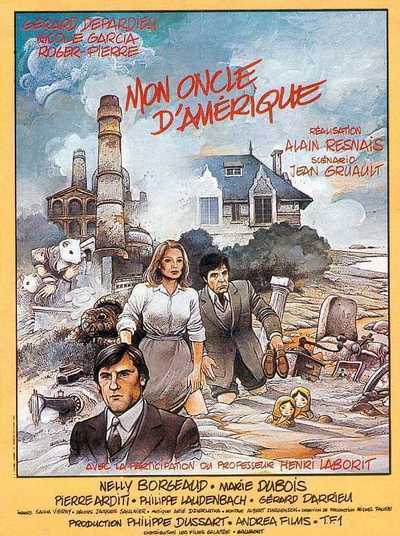 Alain Resnais' "Mon oncle d'Amerique" (1980) is one the New Wave pioneer's best films, a winner of the Grand Prize at Cannes. It is audacious. Beginning with big stars of the time (Gerald Depardieu, Nicole Garcia, Roger Pierre), he tells the life stories of these three in a way that promises to be traditional narrative. Then he introduces a fourth figure. This is the much older Henri Laborit, a physician, philosopher, and expert on evolutionary psychology. Laborit differs from the others in that he isn't fictional. He plays himself, he speaks directly to the camera, he explains his theories about human behavior and how it's often illuminated by tests involving laboratory animals. He had considerable influence on American market research 50 years ago. His involvement in the film becomes its most intriguing element, elevating melodrama to the level of rather disturbing insight. We humans are much concerned with whether or not we truly have free will. There are two popular theories: (a) everything we do is predestined, either by God or as a result of the causes and effects of the physical laws of the universe; (b) yes, we have free will, and can do as we choose, within the limits of practical possibility. I have no idea what Henri Laborit's ideas about God are. I think he believes that our free will is more controlled than we think by instructions from the lower levels of our brain. We do our basic survival functioning at levels formed during the reptilian period, from which we all descend. Our biological behavior is often determined by the conditioning of our mammalian brains, which involve hunger, lust, courtship, territorial competition, and so on. Then humans and to a lesser degree species like chimpanzees and orangutans have a level involving more developed cerebral cortexes. This is where we do our conscious thinking: I choose to do this, but not that. We think we choose. To some degree, we may be pre-inclined to choose, or even forced to choose. Laborit narrates an experiment involving white rats in a lab. Cute little creatures. One is put in a cage divided in half by a doorway. When an alarm is sounded, the floor where it's standing will produce an electric shock in a few seconds. The rat quickly learns to scamper through the door to avoid the pain. Another alarm, another escape, back and forth. Simple. We would do the same. Now the door is closed. The alarm sounds. The rat scrambles desperately to escape. No luck. The electric shock occurs. After a time, the rat gives up trying to escape. It crouches hopelessly, trembling slightly from the electrical current. It is passive, defeated, no longer thinking of a way to escape because there is none. Ah, but now it gets interesting. Two rats are placed in the same divided cage. They quickly learn to run back and forth. The door is closed. Both rats struggle to escape. No luck. Then what happens? Do they give up and crouch forlornly side by side? Not at all. They begin fighting. Did you almost forget I was writing about a movie? Resnais shows his characters growing up in response and reaction to their childhoods. The farm child helps to support his family by going to work in a textile mill. He dreams of studying in Paris, but his girl friend gets pregnant and he remains in the district, eventually becoming in charge of the mill. The girl, a fervent Young Communist, rebels against her parents and runs away to join the theater. Her career goes nowhere, she become the mistress of -- the bourgeois boy, now a politician and the head of French national radio. That's also a rebellion against her youthful ideals. The bourgeois was a devout Catholic, but he leaves his wife and children to live with the mistress. Another rebellion. Oh, and when the worker is demoted and shunted to a distant job, he rebels in a refusal to play along with the corporate plans. So by running away from home, wife and job each of the three has exercised free will, correct? Resnais is only getting started. In scenes which play much better than they may sound, he uses humans dressed as giant white rats in reruns of key scenes from other angles. And Resnais uses Laborit's narration to analyze other scenes. It begins to appear as if all three of these modern French citizens, from different social backgrounds, may have been acting instructions beamed in from their vestigial brain centers. The genius of the film is that even without Laborit and his rats, "Mon oncle d'Amerique" would tell an entertaining story on its own. The characters are sympathetic (given what we know about them), the narrative is well-constructed, and we care. But consider one sequence. In itself it is perfectly absorbing. Then see how Resnais deconstructs it. Jean was raised by his grandfather on an island. He tells Janine he will take her there one day. Two years after they break up, they meet by chance on the island. They cross at low tide to a little nearby island. The tide returns, but as they're returning they pause to continue a fight, and are threatened with being stranded. Hmm. Considering what we know about how they got together, and why and how they split up, and what each one knows and doesn't know, their behavior on this day, which seems so spontaneous, becomes almost compelled by the same conditioning process suffered by the rats. And then we cycle back through other events in the film, seeing those in a new light. I used the word "deconstruction." That can sometimes apply to the study of films in terms of story structure, conventional devices, social meanings, and so on. What Resnais seems to be hinting is that the characters in a movie, and the people who make it, and those who watch it, may all be acting to some degree on impulses imbedded untold millennia ago on the shores of lonely seas. Alain Resnais was born in 1922 and as recently as May 2009 won the Special Jury prize for his new film, "Wild Grass." At the dawn of the New Wave he gained fame for such as "Hiroshima, mon Amour" and "Last Year at Marienbad." He confessed once to me that he's crazy about comic books. He makes great and sometimes weighty films but is not lacking in a quixotic humor, and "Mon oncle d'Amerique" is in some ways a comedy. Also a film that has you discussing to for long afterward, and not in the terms you use for most films. And now my article is completed. It's about the right length, and I'll dispatch it to my editor in plenty of time. In all the years since I won my first newspaper job in high school, I've never missed a single deadline. I like to think that's because I choose not to. I wonder. And you, who are not very good about making deadlines, don't be too quick to blame yourself. Pin it on the turtles. By the way, the American uncle never shows up. Also in my Great Movies Collection: "Hiroshima, mom Amour," "Last Year at Marienbad," "La Belle Noiseuse."